A. Lewis Ward & Associates provides legal education and guidance to help you do everything feasible to successfully collect accounts receivable. A relatively high interest rate should motivate your customers to pay as quickly as possible. However, there is a law stating that for an individual to collect interest over 10 percent, there must be a written contract, and that this contract must precede the transaction resulting in the account receivable. In addition to forming a contract and having the customer agree to it, perfecting a security interest in the goods or products sold will improve your position. Retaining a security interest for the products/goods sometimes allows you to repossess what you’ve sold to the customer if the customer isn’t paying the debt. The constant focus should always be on aggressively pursuing your accounts. Even if you do everything correctly, from providing detailed information on your invoices, to imposing a high interest rate, to being sure you have a security interest, if you aren’t diligent in collecting your money, the consequences can be dire. It is not impossible that the person or business owing your account receivable will go into bankruptcy; especially during these hard times. Therefore, you need to be among the first to collect your money. A. Lewis Ward will typically file an action called a suit on sworn account or breach of contract to collect your accounts. You can recover attorney’s fees and court costs if the cost of representation is reasonable and necessary to the collection. 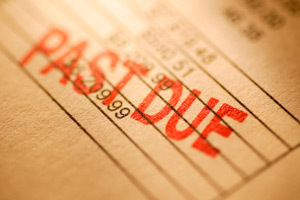 Don’t wind up as an unsecured creditor in your customer’s bankruptcy. To eliminate as much risk as possible concerning your accounts receivable, contact A. Lewis Ward & Associates. Take action today to protect yourself and your business.